ACID 64 Player Pro supports SID emulation! This should be interesting to majority of SID music lovers. Starting from v3.0.4 ACID 64 Player Pro supports JSIDPlay2. 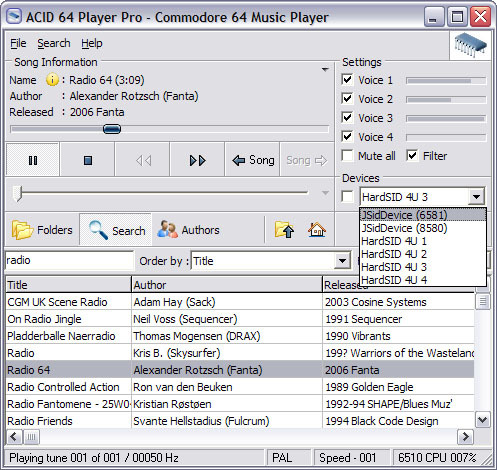 Up to this point ACID 64 Player Pro has been a SID player software only for HardSID users as it has been supporting only HardSID for output device. But it’s now possible to configure JSidDevice as the output source! What this means is that SID sound lovers who don’t have a genuine SID sound card setup can now enjoy today’s state of the art SID emulation with the wonderful ACID 64 Player. I’m sure many of the other SID players out there are nice, but I really haven’t had much reason for comparison – ACID 64 is all I need. For HardSID owners it’s unmatched, but also as software SID player it must be among the best ones. It’s full of features; built-in song search, seeking with a slider, channel and filter control, detailed file information display and it integrates perfectly with the High Voltage SID Collection. The only thing it really lacks is a playlist. But for me and the way I like to listen to SIDs it’s not much of a minus really. How to set it up? Download and run JSidDevice (link to .exe) and select it as the device in ACID 64. What makes this interesting also for SID freaks like me is that now it’s possible to switch between a genuine SID chip and JSIDPlay2 emulation on the fly while a song is playing! Of course the audio output switches between HardSID and the “regular” sound card. But that’s still pretty cool way to compare the 80’s sound chip and today’s emulation of it! This entry was posted on Wednesday, September 15th, 2010 at 20:00 and is filed under C64 Software, SID music. You can follow any responses to this entry through the RSS 2.0 feed. You can leave a response, or trackback from your own site.